Summer is here to stay now the rain is gone. And it’s beginning to look like a scorcher. 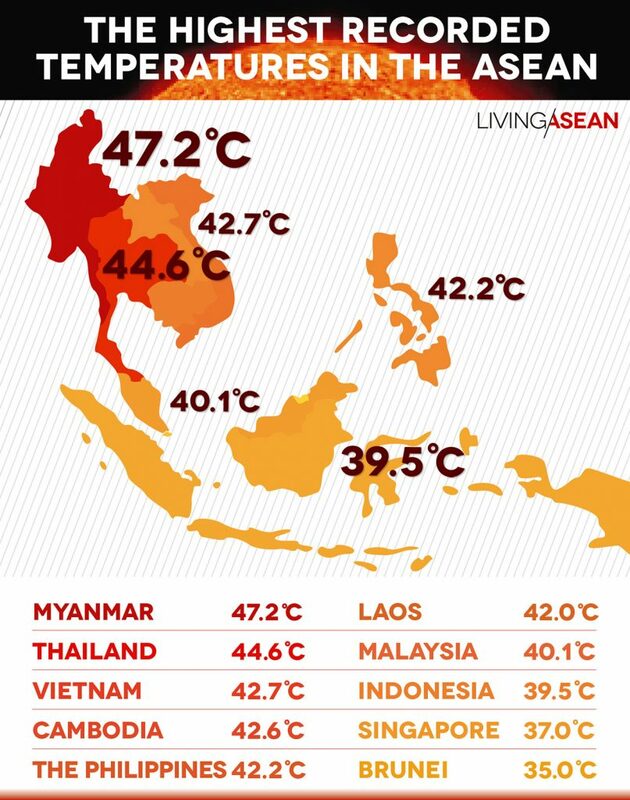 But that’s nothing compared to the highest recorded temperatures in the ten ASEAN countries. Check this out! Thailand: Mae Hong Son saw the hottest temperature on record in Thailand topping out at 44.6 °C (112.3 °F) on April 28, 2016. The previous record was held by Uttaradit at 44.5 °C (112.1 °F) on April 27, 1960. Vietnam: The temperature at Con Cuong rose to a record 42.7 °C (108.9 °F) on May 30, 2015. The city of Con Cuong is located in Nghe An Province in the North Central region of Vietnam. Cambodia: The new all-time record high for Cambodia was set on April 15, 2016 in Preah Vihea when the mercury soared to 42.6 °C (108.7 °F). The Philippines: Mindanao Island observed its highest temperature on record at General Santos with a 39.4 °C (102.9 °F) reading on April 16, 2016. This was a long way from the national record of 42.2 °C (108 °F) held by Tuguegarao in April 1912 and May 1969. Laos: The hottest day at Thakhek sent the mercury soaring to a record 42 °C (107.6 °F) on April 20, 2015. That tied the previous record of 42 °C held by Savannakhet since March 1933. Malaysia: The all-time record in Malaysia was 40.1 °C (104.2 °F) at Chuping on April 9, 1998. Indonesia: There are two candidates. 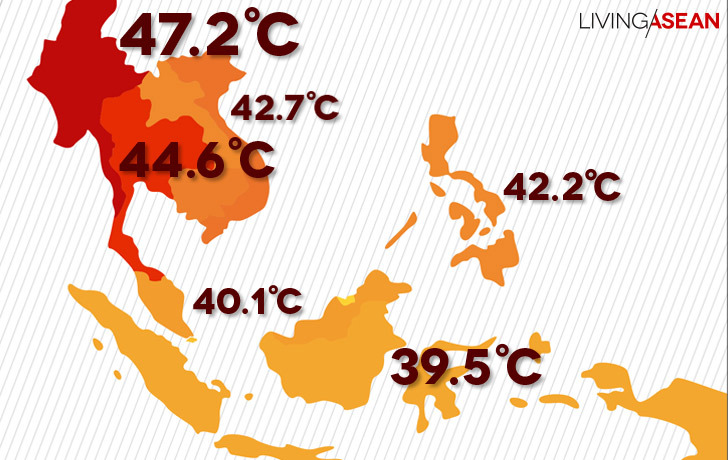 The all-time record high of 38.8 °C (101.8 °F) was measured at Makassar City in Sulawesi in 2012. However, the hottest temperature recorded by reliable sources in the country was 39.5 °C (103.1 °F) at Jatiwangi, on Java on November 19, 2006. Singapore: A record 37 °C (98.6 °F) reading was measured on April 17, 1983 by the Meteorological Service Singapore (MSS), which confirmed the hottest day on record in the island country. Brunei: The hottest day came on July 6, 2015 at Bandar Seri Begawan, the capital of the Sultanate of Brunei, with the mercury rising to a record 35 °C (95 °F). For reference, on that day the average high was 32°C (89.6 °F).